Dinner-time might be interesting in the Nugent household over the coming days after a free-scoring son gave his father a tortuous time! Emmet Nugent was the man of the moment as Freebooters A propelled their way to the top of the Premier Division table with a big win over his father Jim Nugent’s Fort Rangers side on Sunday. The Freebooters’ Nugent helped himself to a hat-trick - all scored against his father - as the Blues racked up the goals in an 11-0 win at Buckley Park. Conor English also bagged a treble, while there were goals for Paddy Cahill, Divine Amaukwu, Success Edogun and David Rice in the win. The game proved to be a real family affair. As well as taking on his father, Emmet’s brothers Eddie and Jim jnr are also part of the Rangers squad! It’s only Freebooters’ second league game of the season, but already Nugent - the Premier Division Player of the Year for 2017/18 - is proving himself a real goal threat. He also scored a hat-trick in their opening day win over Evergreen B! Evergreen A kept up their good start to the 2018/19 season as they picked up three Premier Division points on Sunday. The reigning champions, who have already moved into the semi-finals of the Maher Shield, turned their attentions to league matters and earned a 3-0 win over clubmates Evergreen B on Sunday. Sean Barcoe wasted little time in giving the ‘home’ side the lead, breaking the deadlock with a fifth minute header. They kept that advantage until just before the interval, when Ben Hickey struck to push Gary Maher’s side 2-0 up. The A team all but wrapped up the points within minutes of the start of the second half. Barcoe claimed his second of the game, giving his side a lead they would not lose and piling more misery on the B team, who are still looking for their first ‘away’ point of the season. Elsewhere David Dunne was in the thick of things as Highview Athletic A got their league season off to a good start. Dunne scored twice as the Graig men beat Division One champions Clover United 3-1 in Harristown. Freebooters B made it two wins from two when they beat Bridge United 3-1 in Division One. The Blues, who scored a comeback win over Spa United in their opening tie, took all three points thanks to a Ben Maher penalty, with other strikes from Mohammed Sabri and Andy Walsh. Mikey Brennan was on target for Bridge. Elsewhere Pa Leahy was on target for Evergreen C as they drew 1-1 with Stoneyford. There were goals aplenty in Division Two, with two winners hitting opponents for five. A Gary Hayes-inspired East End United hit the magic number in their 5-3 win over Ormonde Villa while Newpark matched them in their 5-1 win over Castlewarren Celtic at Scanlon Park. Freshford Town didn’t hit the same heights but still picked up three points in their opening game of the season. David Weady scored from the spot as they beat River Rangers 1-0 in Woodview. Highview Athletic B made the best possible start to their season in Division Three, beating St John’s 3-2. Cormac Bolger, Sean Holden and Philly Moylan did the scoring as the Graig men opened their campaign in fine style. Things are not going so well for the Saints, who have just one point from three games played. 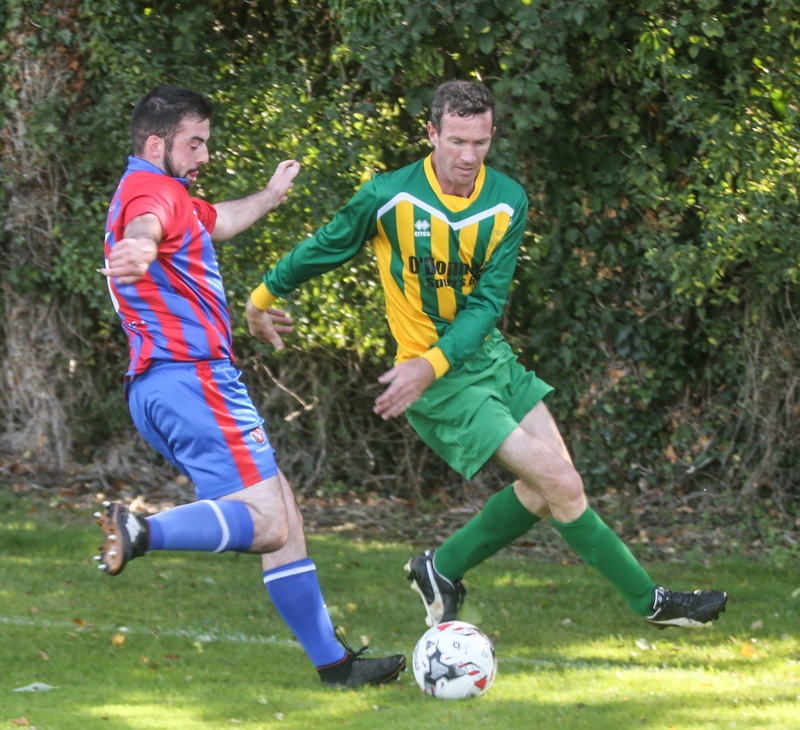 Cathal English and Eddie English were on the mark for Bridge United B as they got the better of their battle with near-neighbours Paulstown 06. Mikey Brennan, who scored for the A team in their 3-1 loss to Freebooters B on Sunday morning, showed his eye for goal by also getting on the scoresheet in the United B team’s 3-0 win that afternoon! It was a good day also for Tullaroan, who picked up their first point since returning to the Kilkenny & District League. They shared the spoils in a 2-2 draw with Newpark B.
Spa United certainly enjoy the dramatic life after going all the way to earn another win in the Maher Shield! 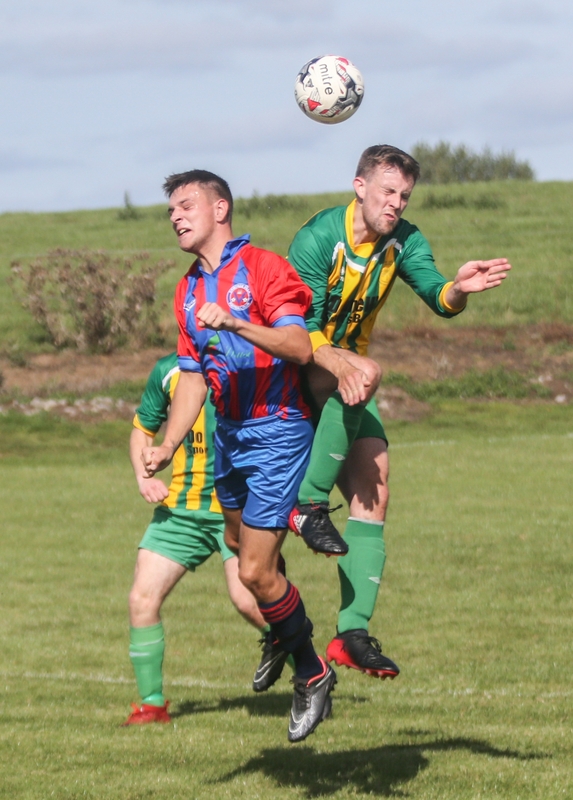 The Johnstown men, who beat Premier Division outfit Fort Rangers on penalties, added another top-flight scalp to their haul when seeing off Deen Celtic in a sudden death shootout on Sunday. It wasn’t always as tense; Martin Phelan and Richie Tobin shot Spa into an early lead, putting the pressure on their Premier Division opponents. Ryan Maguire led the charge for Celtic, pulling a goal back before the half hour, but their cause looked hopeless when Tobin doubled his tally to make it 3-1 to United. Things went from bad to worse when the visitors were reduced to 10 men but still Celtic refused to throw in the towel. A quickfire brace from Maguire, with assists from M.J. Feehan, sealed the striker’s hat-trick and helped the Castlecomer side turn things around and send the game to extra-time. Short a number of regular players Celtic turned to youth for the game - that included playing teenager Owain Comerford in goal for the game. He made his presence felt, pulling off a fine save to send the penalty shoot-out to sudden death, but Spa held their nerve in the additional kicks to book the last semi-final berth. They now join defending champions Evergreen A, last year’s beaten finalists Highview Athletic and Thomastown United in the final four.